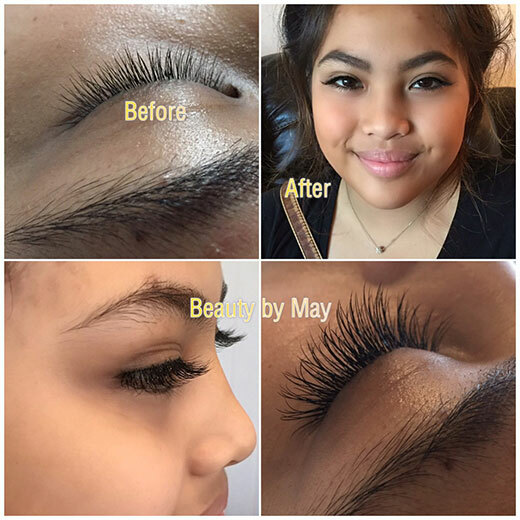 We offer professional Natural Eyelashes Extension by extending the length, fullness and beauty of eyelashes using 100% natural looking extension. Eyelash Extension are semi-permanent extensions that will extend your eyelashes for a beautyful and natural look. Eyelash Extension are perfect for special occasions or everyday wear for vibrant, long and luscious lashes. Our products are safe on your eye and completely "formaldehyde free" cyanoacrylate adhesive exits. They are applied to individual eyelashes, one lash at a time, for an elegrant, natural and luscious look. Semi permanent Eyelashes that can last up to five to eight weeks if cared for properly. These lashes are bonded with the hightest quality pharmaccutical grade bonding agent formulated by P.H.D. chemist. Imagine being able to sleep, swim, shower and enjoy sports without smudgy makeup.